Marathon Des Sables 2014 finisher, Lucja Leonard from Edinburg Scotland has been running for six years. Her great passions are travel and running, with a soft spot for multi-stage ultras. 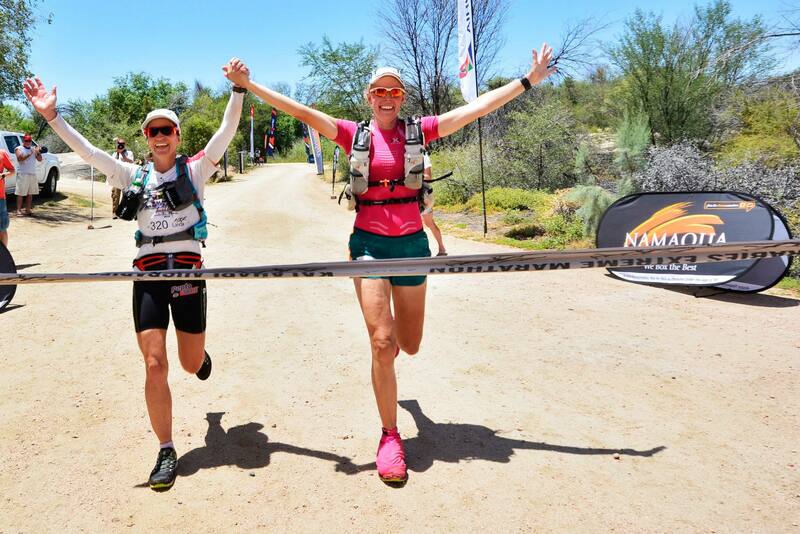 Lucja and her husband Dion Leonard recently traveled to South Africa to compete in “SA’s Big Daddy”, the Kalahari Augrabies Extreme Marathon – a 250km self-sufficient footrace through the Kalahari Desert. Assured of tough conditions and stiff competition the Leonard’s claimed 2nd place in the male and female categories, respectively. Ultrarunner interviewed Lucja to hear what motivates her to keep going from strength to strength! UR: What first grabbed your attention about ultra-running and when did you run your first ultra? LL: I heard about ultra-running when my husband bought me the book ‘The World’s Toughest Endurance Challenges’ by Paul Moore and Richard Hoad for my birthday in 2012, I jokingly said ‘the first page I open it to is the challenge we are going to do’, I opened the book to the page about the Kalahari Augrabies Extreme Marathon and a commitment was born! I did actually run my 1st ultra in preparation for the KAEM 2013 by running the Endurance Life 33mile race in Whitby earlier that same year. UR: Can you share what ultra-running means to you and what impact it has on your life? LL: Ultra-running has become my life, it is such an open and accepting community of like-minded people and the challenges of each individual event test you in so many different ways, both physically and mentally, which I think makes you a better person day to day. It has transformed my life. It was not so long ago that I was overweight and unfit, and now I am full of energy, fit and healthy with a real passion for life, nothing seems too big a challenge to overcome, even when you do find that race that you DNF in, it isn’t a failure it’s a learning experience and you look within yourself to overcome it and find a way to go back and complete the challenge. UR: Which ultras have you completed to date? June 19/20 2014 – Mohican 100 miles – DNF pulled out after 2 laps (53 miles) due to de hydration and foot issues. UR: How do you find time to train and participate in ultra-running events? LL: I make time! I have a very demanding job and this can involve long hours but I find if I am signed up to a race that helps my motivation to make me either get out of bed at unfavorable hours or out late running into the night to make sure I get the training in. It’s about being super organised and planned, unfortunately my ‘other’ social life does suffer as after a big day out training or racing I’m normally in bed by 8pm! UR: Can you share with us what your training programme would look like preparing for a 250km multi-stage unsupported desert race? LL: My training programme would be focussed on a mixture of sessions through the week incorporating speed, tempo and hill repeats along with some strength and conditioning (I like Crossfit) and a small bit of cross training on the turbo bike. The weekend is made up of back to back long runs with my pack (usually at about 6kg) with at least one rest day each week and the training plan being made up into blocks of about 4-5 weeks, with a few races in there as well to get me race ready. UR: Do you do most of your training on trails or do you still include a lot of road running? LL: Most of my training has now moved to trails since starting on the ultra scene, prior to that it was all road running but I find the trails are gentler on the joints, they are more fun and scenic and have definitely improved my overall strength and fitness compared to the road, and I feel happier! UR: You’ve competed in a number of races this year, how do you stay motivated? LL: By signing up to more fun & exciting races to keep me excited and on track. Seeing improvements helps me too. UR: Do you experience any overuse injuries and how do you deal with them? LL: Touch wood, no. Prevention is better than cure and I focus very much on looking after my body, I eat well, and I sleep…..A LOT! I try to always make sure after any long training run or race I stick to my tried and tested recovery routine – stretch as much as humanly possible (depending on how exhausted I am but the more the better), eat & get a recovery shake in within the first 30mins of finishing (I like For Goodness Shakes recovery shakes or some chocolate milk or a smoothie does the trick too), nice hot shower or even better a soak in a hot bath, get my Compressport quad and calf guards on and get the feet up! I will always sleep in my compression after a big run, and try to get myself in for a sports massage every 2 months or so. If I am tired and my body is telling me so I skip the run and rest, it is so important to do. UR: How important is having the “right” kit in either being competitive or finishing a multi-stage self-sufficient race? LL: To be competitive I think it is very important. You need to feel so comfortable with your kit that you don’t even notice it, it should be tried and tested, by you, not by a friend or some elite runner you’ve been reading about, but you! And tested in as many conditions as possible to make sure it works properly, ideally if you can mimic race conditions but take it from my experience that training in Scotland is very different to running in the desert but I did plenty of long hard miles to test all my kit out. Once you have found the right kit, stick to it, but not religiously, time and technology moves on and you could be missing out if you are too set in your ways but it is great to have a fall back option. UR: Which type of ultras do you prefer to run? LL: I tend to like the multi days or the longer distances (over 50 miles) as I find that I can keep going, not necessarily getting stronger, but as other runners are dropping around you, I can keep going and that then gives me better results where as in a shorter ultra I need to run faster when I prefer to just go steady. UR: You’ve done KAEM twice. Tell us more about your race this year. How different was the experience to last year? Any new things you’ve experience this year on the course? LL: The experience was more competitive for me, last year I went with the aim to complete, this year I went to compete which meant every day was a race, there was no chance to relax until the last day when I had the opportunity to take it easy as the competition was over- there was no chance to gain any more spots so a great chance to run with fellow competitor & South African runner, Linda Doke. I did experience new things, I saw giraffes! Last year everyone saw them except me, I must have been running with my head down looking at the ground, this year I felt I was a much stronger runner and I ran constantly looking up and alert. UR: What were some of your race highlights and low points at KAEM? LL: My race highlight was definitely the long day, I really gave it my all and was completely and utterly spent at the end that I had to lay face down for about 15 minutes before I could move, but inwardly I was so excited as I had absolutely smashed the day! My low point was day 2 for some reason I didn’t have energy and I hadn’t planned enough fuel (food) for that day during the race – I was so lethargic and felt horrible. The overall highlight though, race aside, is the people, from the fellow competitors to the organisers and volunteers, this race offers you the chance of a lifetime to meet and run with the most amazing bunch of people from all walks of life. UR: What was your nutrition like for KAEM? LL: It was spot on! I have spent a lot of time working on my very nerdy spreadsheet analysing every gram of weight, every calorie, carbohydrate, protein and fat, testing and trialling what works for me. My general day consisted of a Chia Charge flapjack for breakfast with some trail mix, gels & bars whilst running, For Goodness Shake recovery powder/salted nuts/peperami sticks for snacks and a dehydrated meal in the evening. My calorie count ranged from 1,700 calories on day one (as you have breakfast not counted in the count) up to 3,700 calories on the rest day (which is loads but I wanted to make sure I refuelled well). UR: What is the most challenging ultra you’ve done? LL: The Mohican 100 because it beat me but I will be going back to finish it in 2016, I won’t be beaten! UR: What do you find most difficult about ultras? LL: Eating! Which is bizarre as anyone who knows me would tell you I am not shy about my appetite, I absolutely love food, but during an ultra I just don’t want to eat and have to force myself to keep eating, having learnt the hard way a few times now what happens when I don’t eat. UR: Do you have a special mantra – what do you tell yourself when the going gets tough? LL: “It ain’t how hard you can hit, it’s about how hard you can get hit and keep moving forward, how much you can take and keep moving forward. That’s how winning is done” courtesy of Rocky Balboa, anything from Rocky gets me going. UR: What skills do you feel is necessary for success in long distance events? LL: Apart from being fit, mental toughness is key along with being able to constantly check in on yourself to essentially look after yourself to make sure you finish. UR: What unique skill or mindset do you possess that aids you in ultra-running? LL: A very stubborn one, I may not always be the quickest but I don’t like to give up. UR: What is your proudest ultra-running moment/achievement to date? LL: The long day this year at KAEM, 70km and I came in 5th overall, which after a dismal effort on the Marathon Des Sables long day was such a confidence booster and made me feel so good. UR: Is there something you find easy today because of your ultra-running? LL: Being confident, there is nothing you can throw at me that I can’t or won’t handle. LL: Edinburgh Run Tours is for all of you! It is for runners visiting Edinburgh that want to experience the city from a different perspective, getting a local take on the city whilst seeing some of the main sites, getting your bearings, keeping your fitness in check whilst you are away and most importantly having a good chat with a fellow runner to make you feel right at home. It’s for every and any level of fitness, run at your pace at the distance you choose. UR: What do you have on your calendar for 2015, any big ticket items to share? LL: 2015 is going to be a big year in the mountains, warming up with a favourite event in the UK, Pilgrims Challenge (run by previous KAEM run Neil from XNRG) and then I am off to run the 125km Transgrancanaria in March with 8,500m ascent, the 73.3km Transvulcania in May with 8,525m ascent and if I keep my fingers crossed for the ballot, UTMB in August. A very big year indeed! UR: What do you hope to achieve with your ultra-running? LL: I would love to be involved in a massive challenge, I was really envious of Mimi Anderson and Samantha Gash with their recent challenge of running across the Freedom Trail in South Africa and would jump at the chance to be involved in such an adventure. 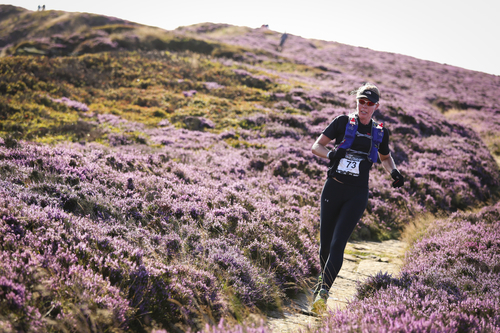 More generally day to day I would love to be working with runners looking to step into ultra-running or to improve their ultra-running through coaching them and writing training plans and perhaps venturing into organising my own races. LL: How life-changing it is! Don’t hesitate, just sign up to an event, make it happen and you won’t look back, you will be so surprised at what your body is capable of, I promise! Ultrarunner wishes Lucja all the best with her training and racing in 2015! NextI’m going to be a runner… a trail runner!